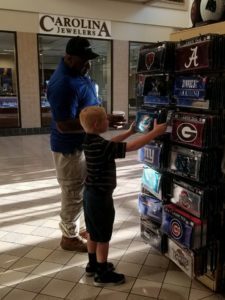 PINEVILLE, NORTH CAROLINA – Talk to many of our Pro Image Sports owners and they’ll tell you one of the joys of having a store over the years has been the opportunity it afforded them to work with and teach their children business in an environment they enjoy. 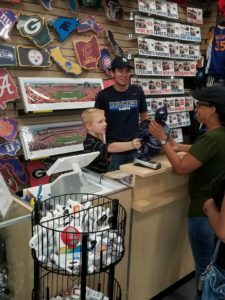 Saying Jack Wappes enjoys tagging along to work at the store with his mother Alyssa is an understatement. So on a recent school break Alyssa cut Jack loose to work as much as he wanted. He performed more like a 7-year veteran store manager than a 7-year old. Below are some shots of Jack in action. It means the future is bright at Pro Image Sports at the store in Carolina Place Mall.